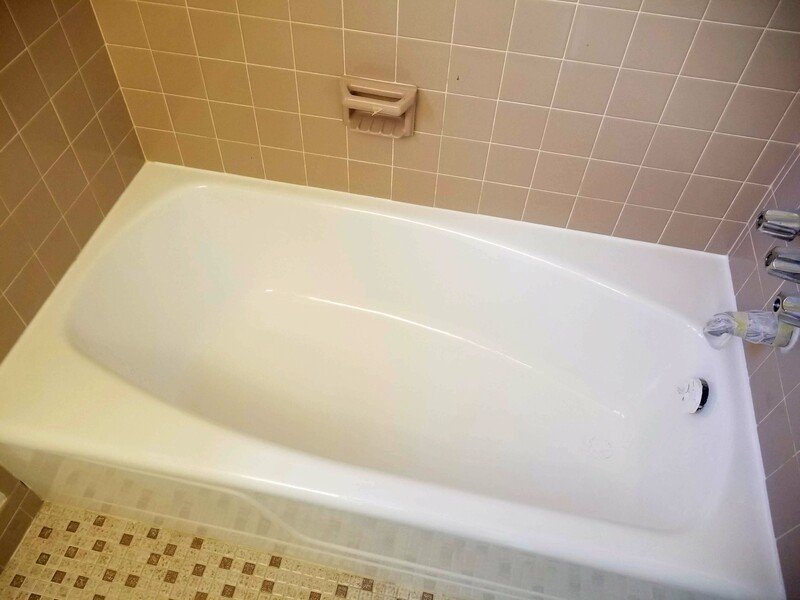 Here is a quick rundown of the steps for a standard tub refinishing job, paint removal and shower doors are additional steps not included here. Upon entering property Cover carpets and hallways with a drop cloth, paper or plastic. Set up exhaust ventilation, either use bathroom window (if to the side of the tub) or connect to vent hoses and run to the nearest window. Using a heavy-duty scraper remove all silicone/ acrylic caulk, use a heat gun if necessary to soften caulk, it will remove all traces of caulk. Scrape tub surface with razor blade scrapers 2″ and 4″ remove most dark deposits, then vacuum. Wash tub with soap remover and green heavy-duty scrubber pad, removing all leftover deposits and rinse with plenty of water, remove excess water. With respirator on, apply acid etch with 4″ paint brush covering all tub areas, beginning with the top, work your way to the sides then the bottom and the outside being careful not to drip acid on the floor, allow 15 minutes before rinsing with hot water, rinse several times to remove all residue, using scrubber pad to make sure no residue remains on tub surface. If rust is present treat with a rust inhibitor, allow to dry, fill chips, cracks and damaged areas with a fiberglass body filler, allow to dry and sand smooth. Completely mask and cover surfaces with masking paper and tape. Using sandwich bags and tape, attach 1 bag to the shower head and to the tub spout, remove all loose materials, sandpaper and vacuum area completely. Mix topcoat, reduce accordingly, carefully tack down the primed surface with tack cloth using a flashlight to inspect the area thoroughly. Spray 2-3 coats allowing 3-5 minutes in between coats. Remove all tape, paper, and plastic and dispose of in a trash bag. Apply GE silicone caulking to all three sides.